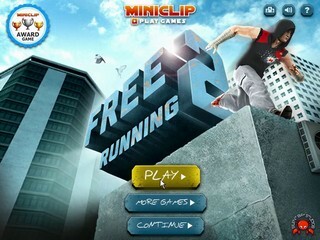 Free Running 2 is based on parkour mixed with some free running, as you find yourself on top of skyscrapers and scaffolding in the middle of the big city. Don't fall off! Best time: Single-segment 0:10:39 by Carsten 'djcj' Janssen on 2013-11-12. Single-segment 0:10:39 by Carsten 'djcj' Janssen. If you want an explanation of the tricks, read the IL comments. Overall I'm really satisfied with this run. There are almost no mistakes and even the super-jumps went pretty well. Though at the time I did this run I hadn't discovered the trick that glitches you through the vents yet. I think the biggest mistake is at the end of the run where I accidentally hit a camera item. General tactics: avoiding to climb as often as possible and never hit one of those red camera items, because they will trigger a few seconds long Matrix-slow-down-camera-turn-around. The super-jumps used in here work like this: gain speed on those acceleration tracks and press jump at the same time you hit the ground. It's a bit like bunnyhopping. Unfortunately I wasn't able to keep that up until the end of the level. The reason is that the distance you jump is a bit inconvenient. Very often you fall down the building very early. The suicide saved me from climbing up the big obstacle. You can't really speed up the beginning because of the moving platforms. The death abuses in this level save only very little time. One trick in this level is to wait a second before starting it. That way the moving platform will be at the right spot to use it to jumnp across the huge gap. If you start too soon or too late you will have to wait for the platform to be at the right position and lose time. It's hard to notice but at 44 seconds I'm doing an edge-jump (I think it's an edge-jump) that saves maybe up to a second. At the end of the level I just have to cross a certain line to win this level. I don't have to enter the red circle. This is the only level where this is the case. Super-jumping straight ot the end is a bit tricky. Often you fall to death right before reaching the last area. Very often I accidentally perform a double-jump at 18 seconds which will screw up the pacing of my super-jumps and I will fall to death. The glitch I've been using after the jumps is really weird and hard to trigger and control. I haven't been able yet to keep this mid-air movement up to the next huge office building. By far the most difficult level. The reason for this are the two super-jump sessions in here. At the first part I had tried to keep the jumping up until I reach the big office building. It's possible but I can't perform it consistently. The death wasn't intended but didn't cost me any time since I died at almost the same spot where I immediately respawned. One problem of the second super-jump part is that if you jump too far and miss the red circle at the end you will keep sliding against the fence behind it and you're not able to move anywhere else, so you can't even commit suicide if that happens. This could screw up an entire signle-segment attempt! Also, in very rare cases I can jump across the gap at 0:10. I think that involves a double-jump but I'm not entirely sure and so far I haven't been able to use this consistently.